Preliminary Listing -MORE DETAILS COMING SOON! The hull of the 102' Teledyne Motor Yacht WILLIAM I was built in Morgan city Louisiana 1975 to government and ABS standards in a shipyard owned by Teledyne corporation a division of general dynamics which had originally been Seward/Seacraft. The yard had been under government contract building swiftboat gunboats for the Vietnam war. It was therefore built to military specs. The bottom is 1/2" aluminum and the top sides are of 3/8" stock. It is built on longitudinals, that is 3-inch I-beams running the length of the hull on 11-inch centers with ring frames on 31-inch centers. The Teledyne yard was closed in 1975 at the end of the war and this hull, which had been built for the president of the company to build a yacht, was sold. The first owner was Jerry Lips who took it across the river to swift ship who built the superstructure. Mr. Lips operated the boat for about four years and then sold it to Dwight Winkleman Who took the boat to the Roscioli yard where a 14 month refit ensued.The Winklemans operated the boat from 1979 to 1983, when they passed away. At that time Jerome Cohen bought the boat, he installed stabilizers, a bow thruster and did many other changes. In 1986, Mr. Cohen had the boat lengthened primarily in order to add fuel capacity for transit Atlantic voyages making the range about 5000 nm with 7000 USG diesel fuel. The boat was lengthened 15ft from the transom aft on the main deck. The extension was done to the same scantlings as the original vessel. The running gear was also extended aft 8 feet and a skeg was added under the extension. All of these additions vastly improved the sea keeping of the vessel. In 2000, an interior refit was done with new removable ceiling panels, lighting, window treatments, upholstery, rugs, etc. WILLIAM I has made six transit Atlantic Voyages since 1987. Through some difficult trips she has proven to be rugged, sea kindly, and comfortable. United Yacht Sales New Jersey would love to guide you through a personal showing of this 102' Swiftships Teledyne 1986. 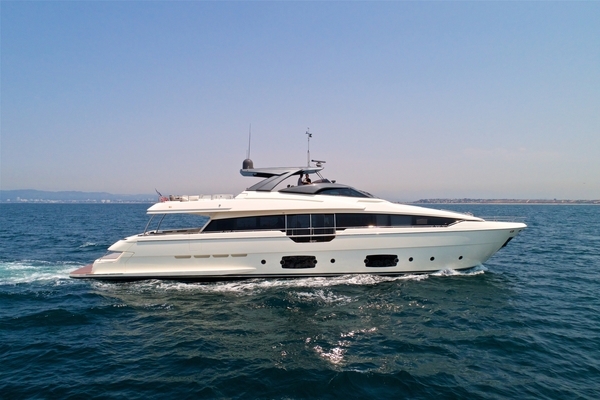 This yacht for sale is located in Fort Lauderdale, Florida and priced at $950,000. For a showing please contact us by filling out the form on this page and we will get back to you shortly!